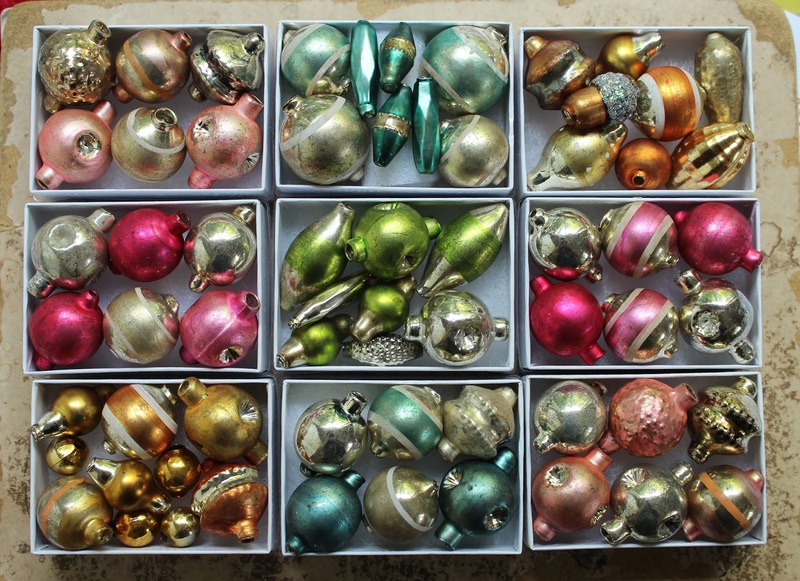 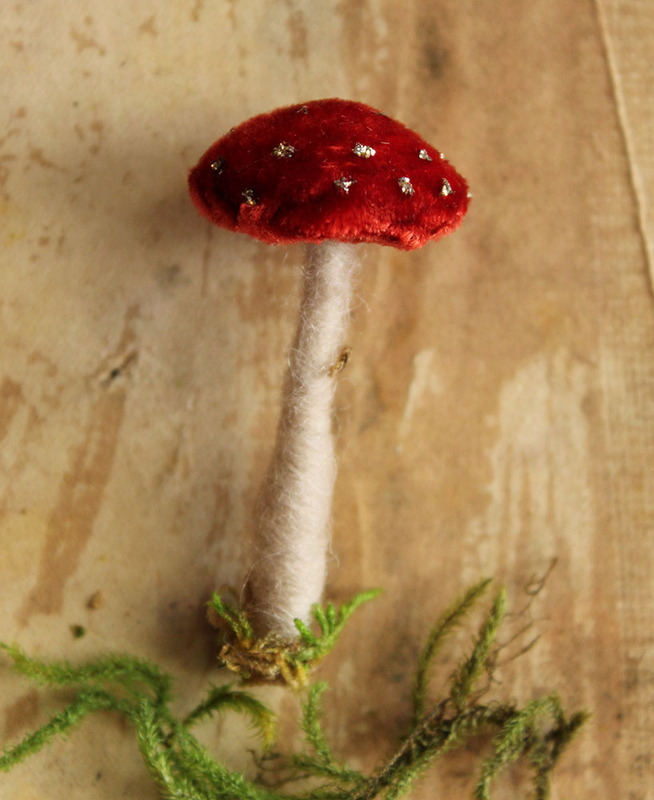 such a lovely holiday weekend for making mushroom ornaments! 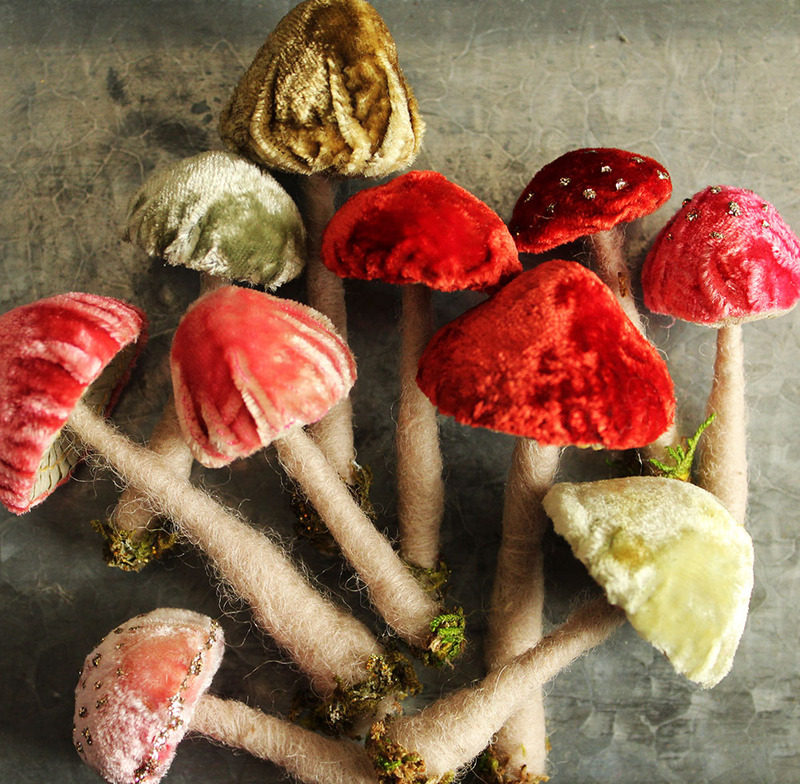 this is a new design I have been working on with needle felted wool wired stems and silk velvet mushroom caps. 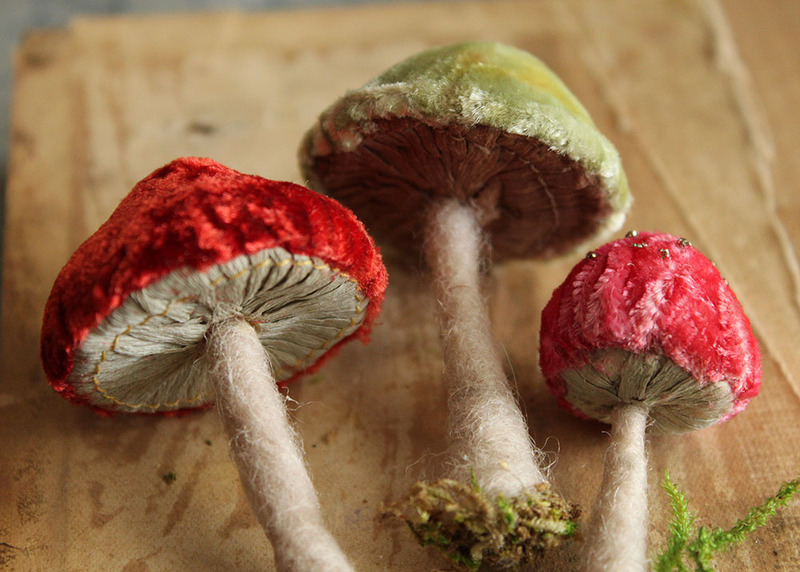 The hand dyed velvet has such a beautiful color variation that shows off so well on the mushroom caps. 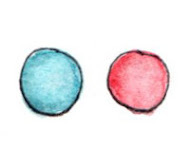 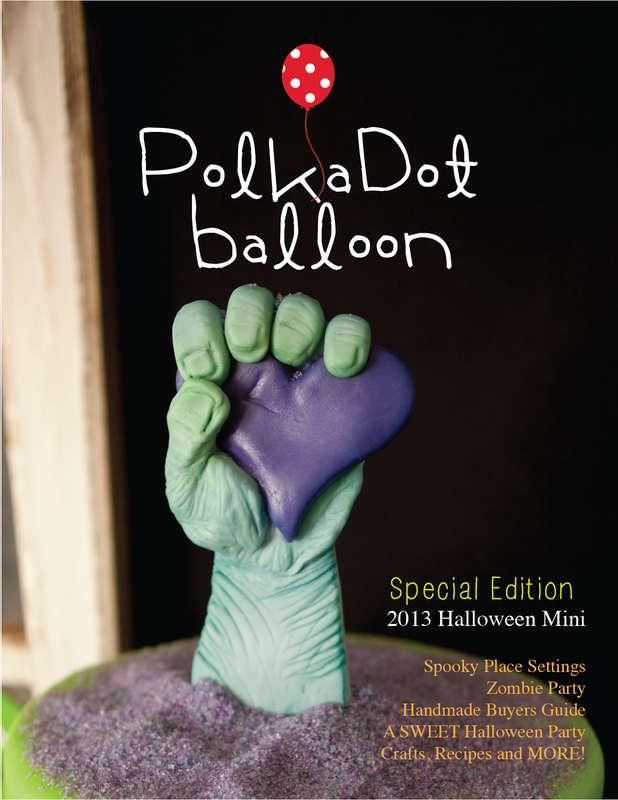 there are even a couple with glitter spots. 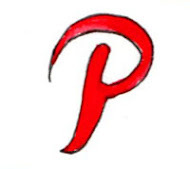 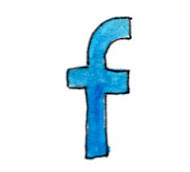 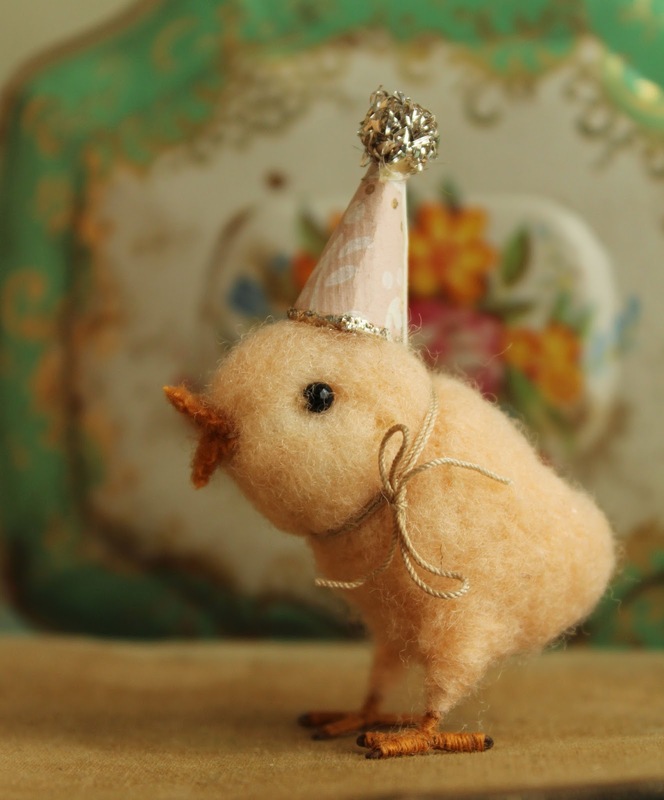 happy holiday week ! 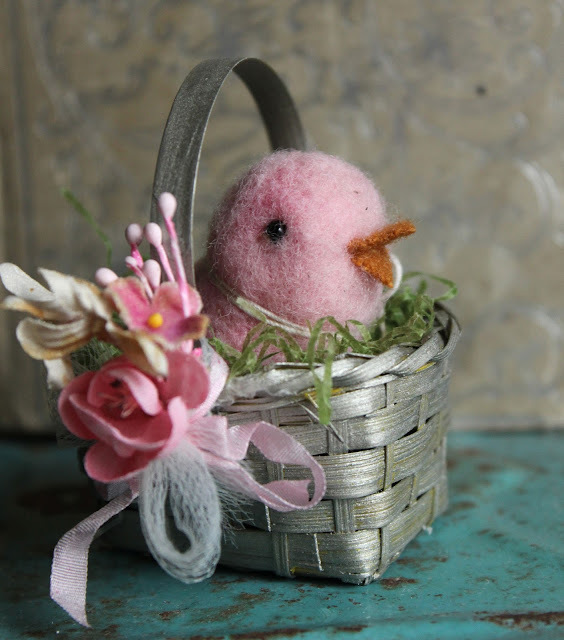 something just so magical about everything bursting into bloom every springtime.!! 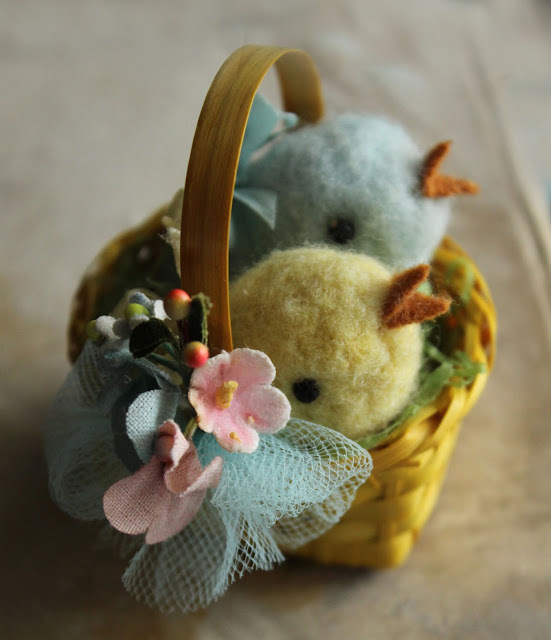 and here are the twins. 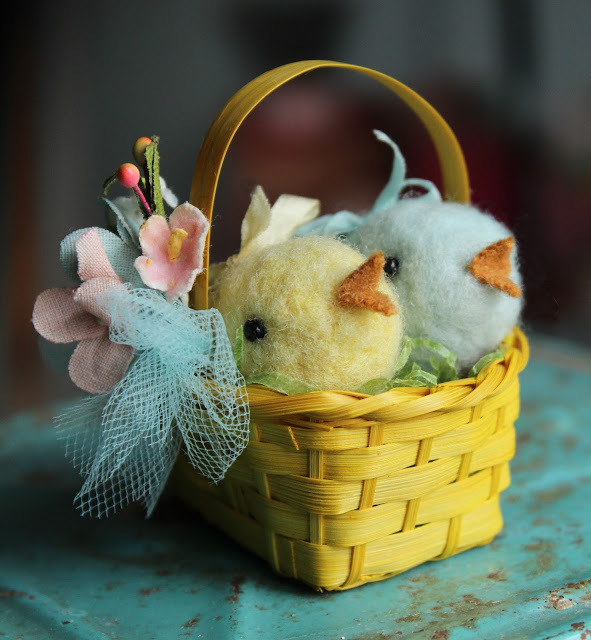 I still have to make their basket in the morning. 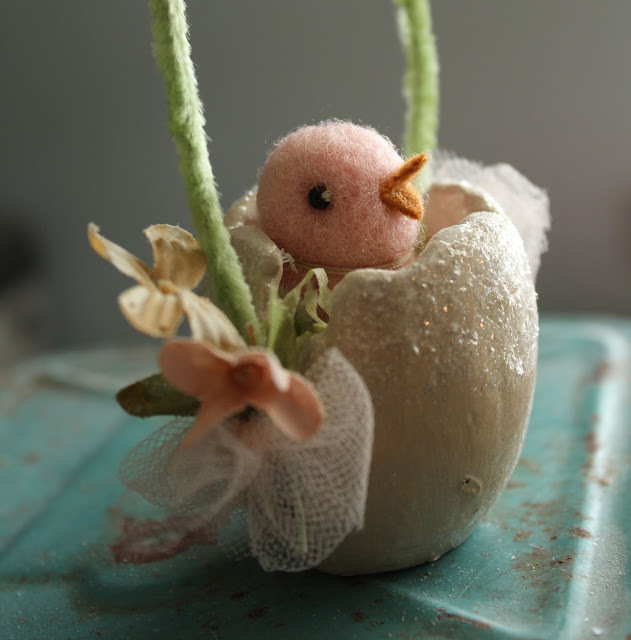 just hatched... this batch of chicks. 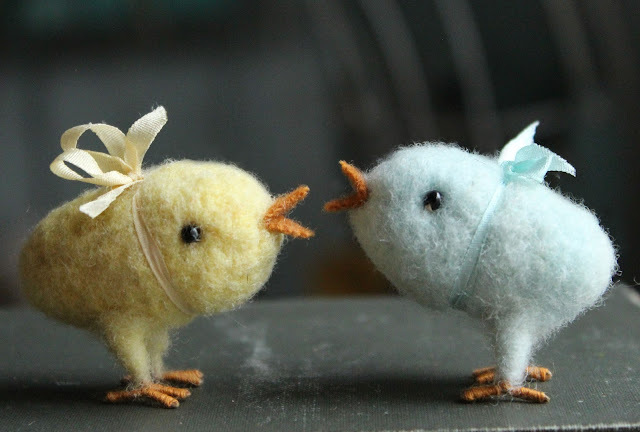 so wish they were real, wouldn't that be so sweet ! in my Etsy shop just in time for Easter. 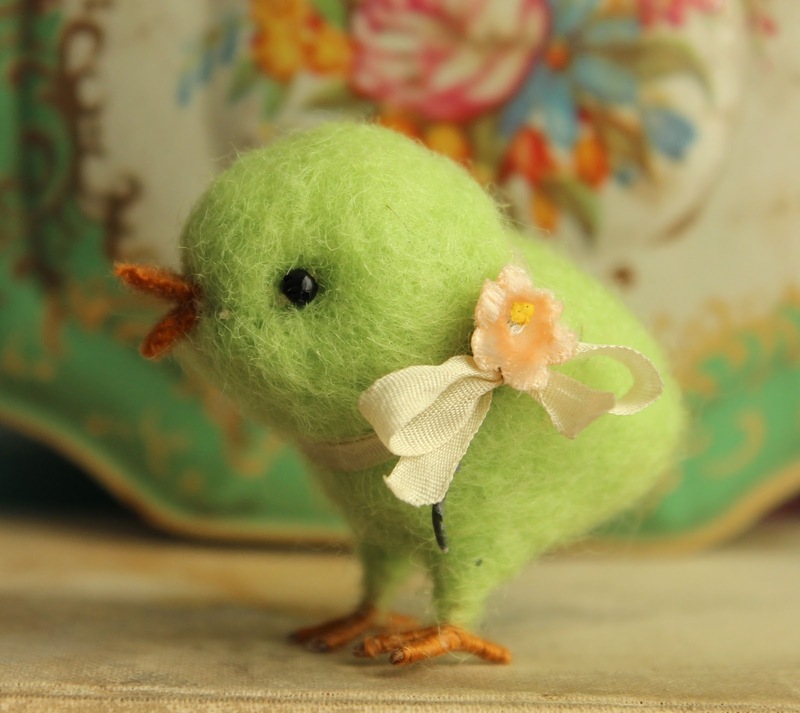 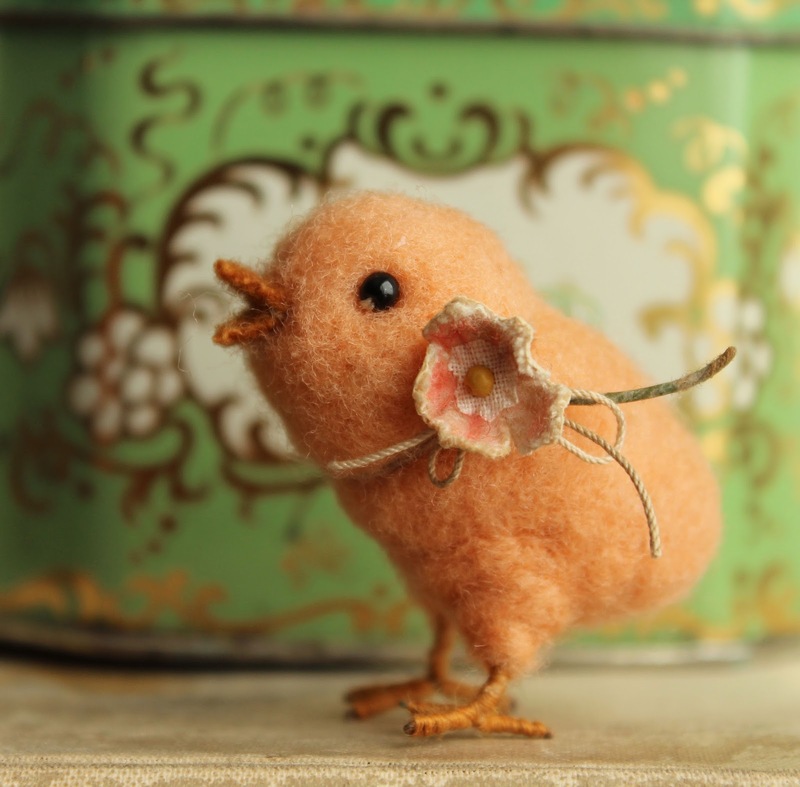 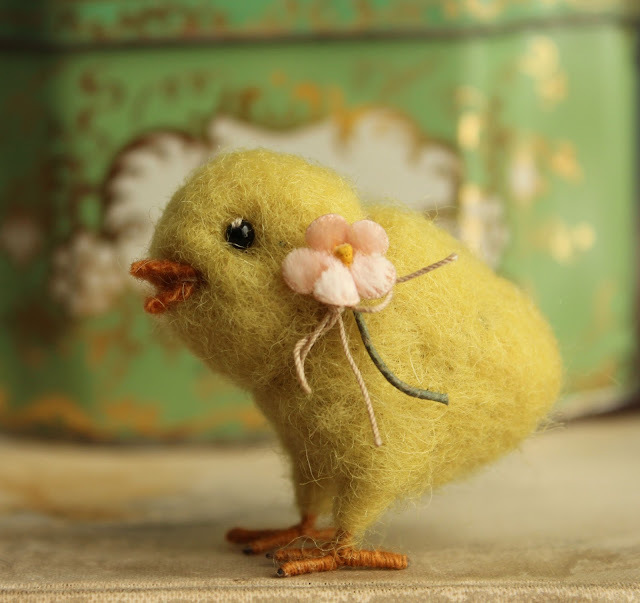 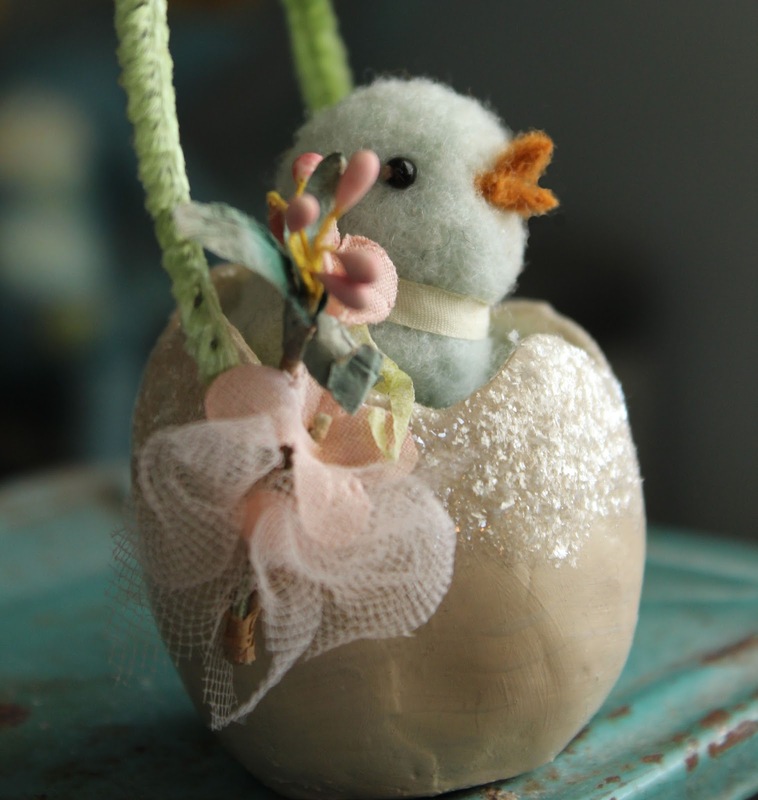 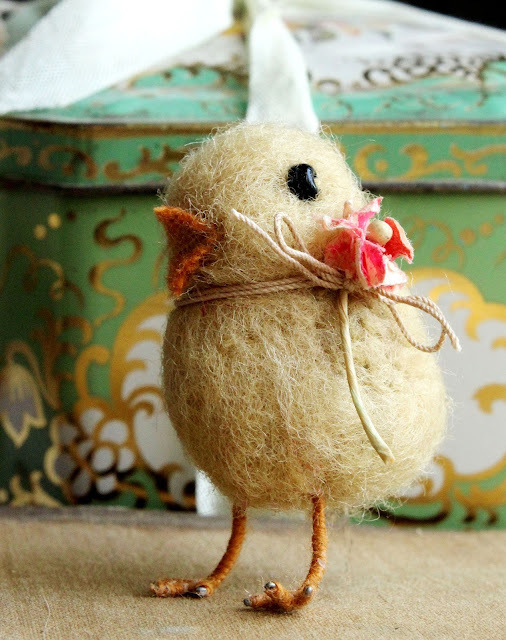 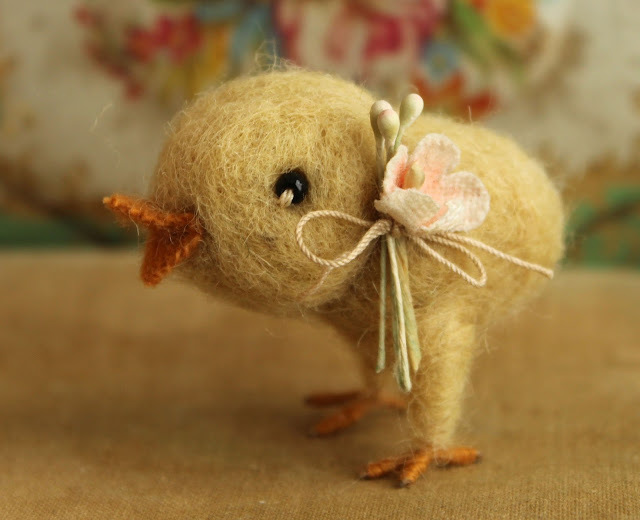 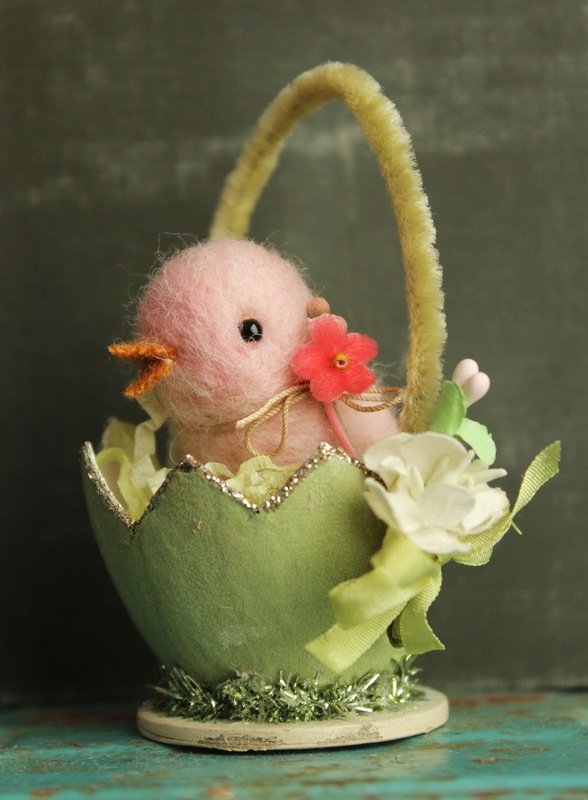 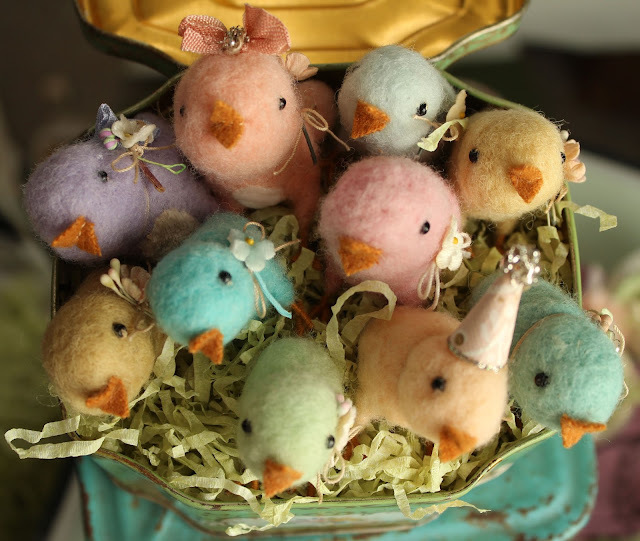 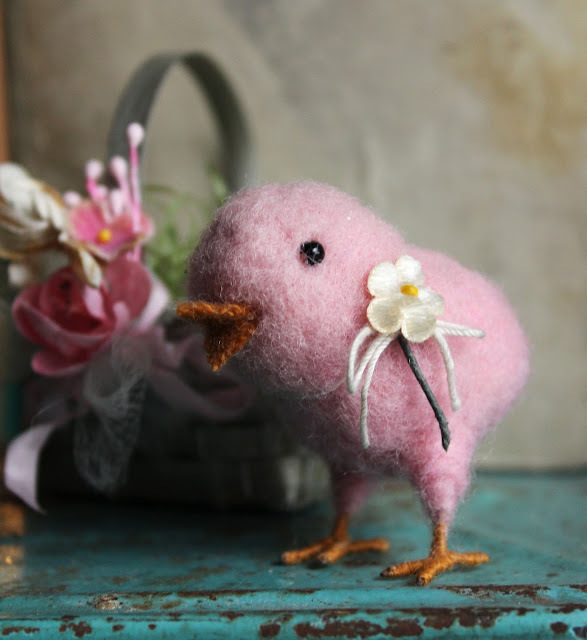 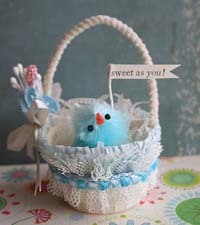 sweet baby chicks are now in the shop for Easter~ This pale blue chick is already on its way to Christine. 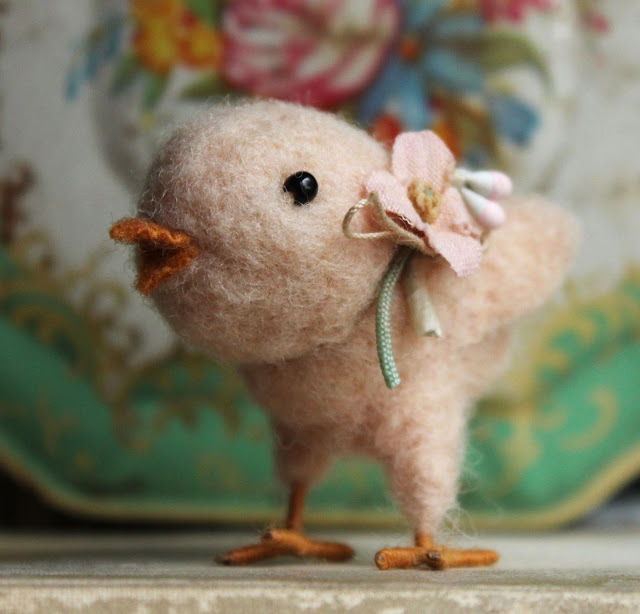 love this little peachy chick, pose able tiny feet and such a darling vintage blossom around her neck. 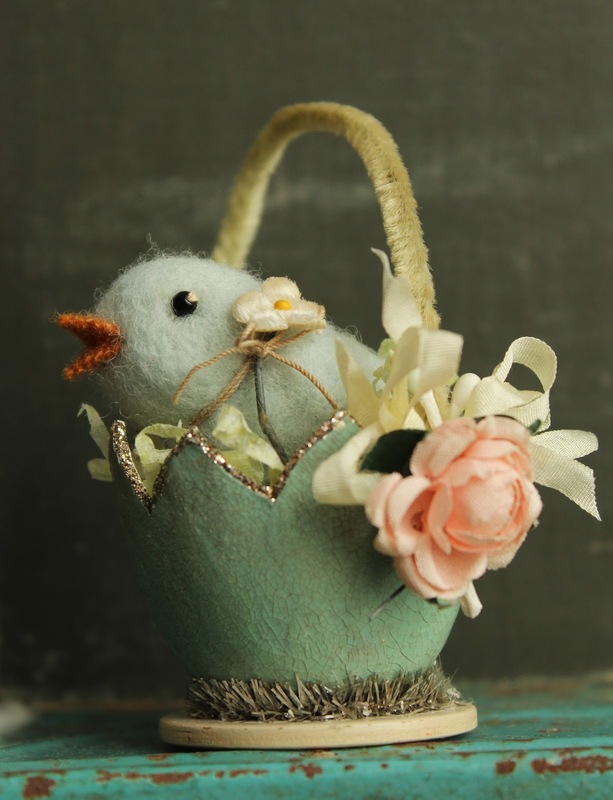 paper mache egg cache sparkling with glitter and decorated with vintage millinery flowers. 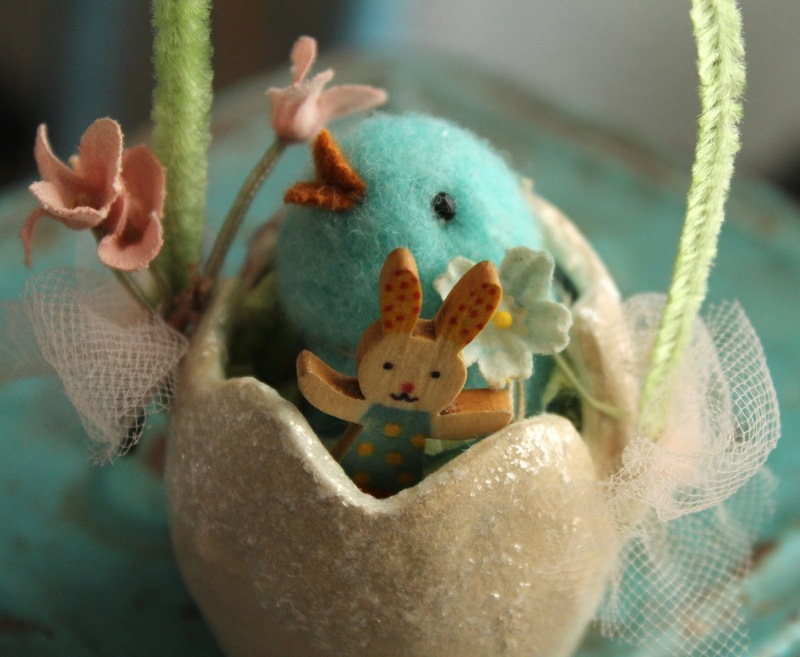 this little one comes with a wee painted bunny toy... things have certainly been hopping around here. I have been having so much fun making some tiny springtime needle felted critters. 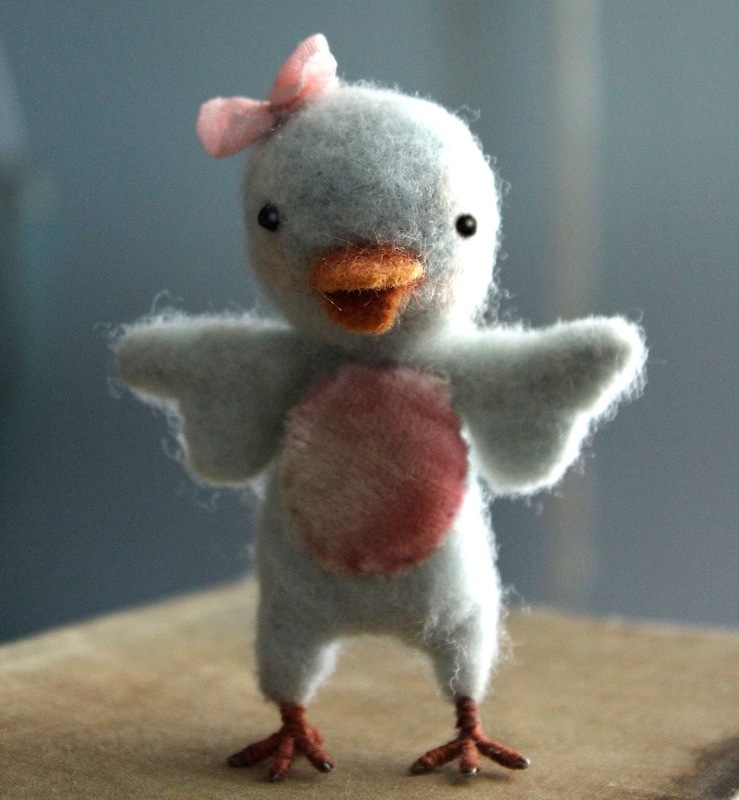 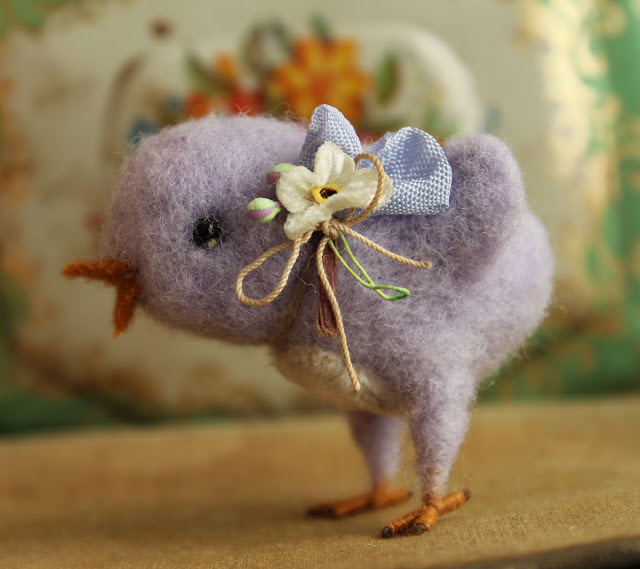 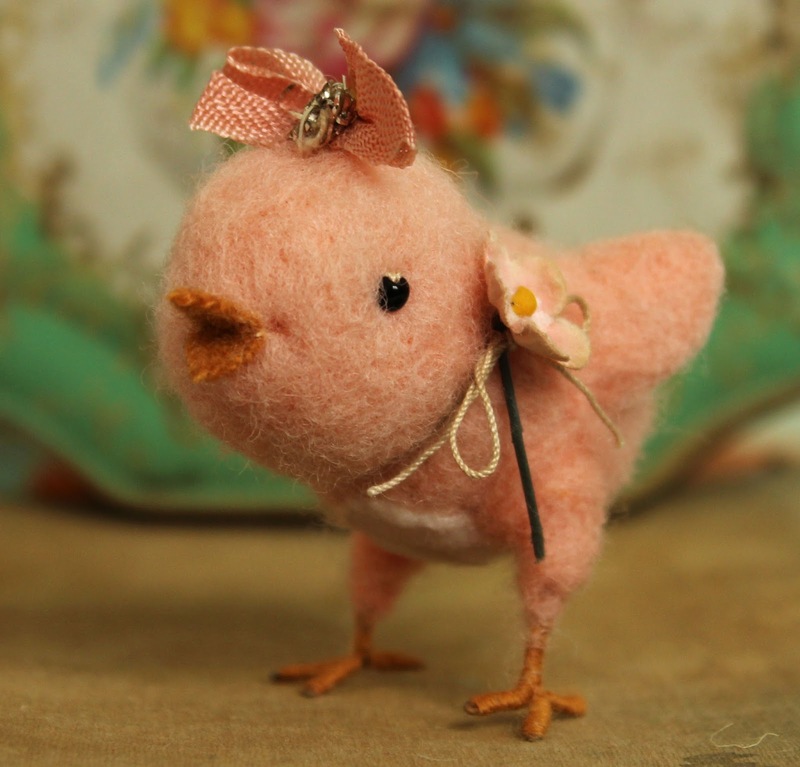 This tiny pale blue chick stands only 3 inches tall and has a tiny silk velvet tummy, my favorite! 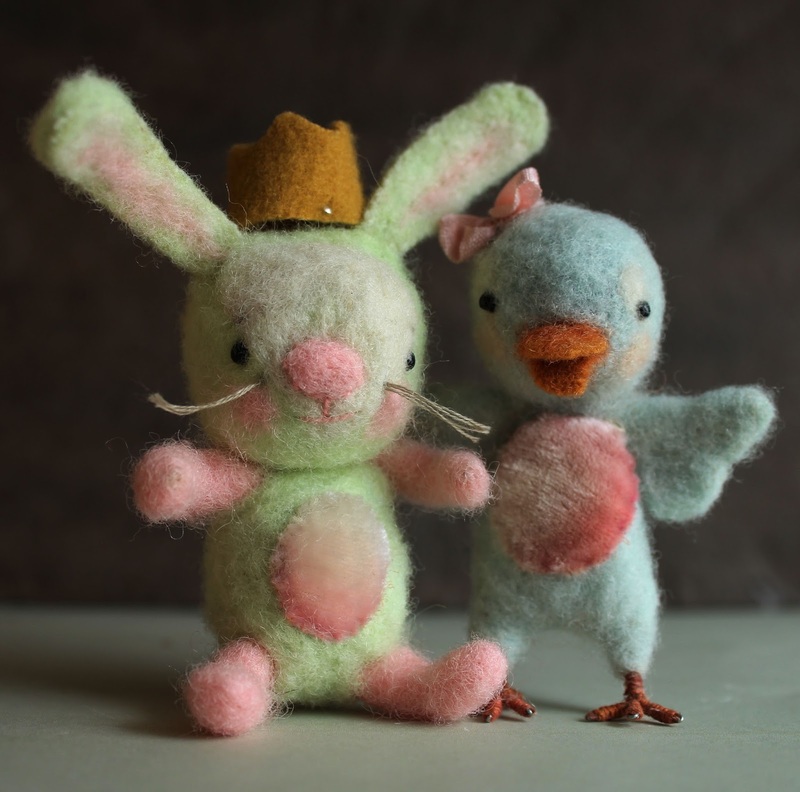 this is a work in progress, I am working on a little crown for king bunny as it is his bithday! 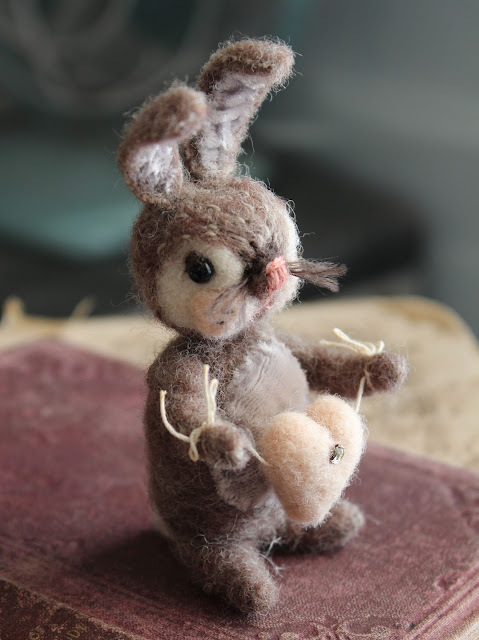 this sweet bunny is holding a wee heart for you with a vintage sew on rhinestone in the middle from an old party dress. 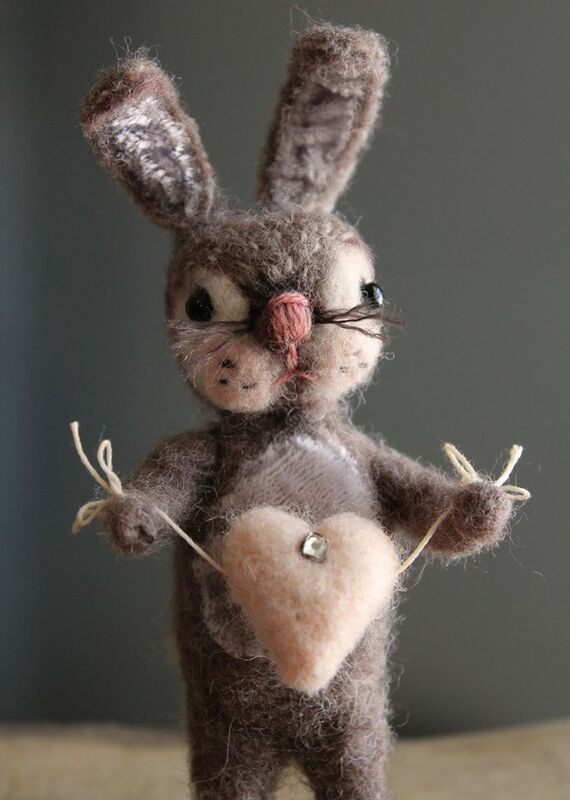 I added little stitches and velvet tummy and ears. 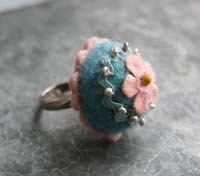 Oh so soft. 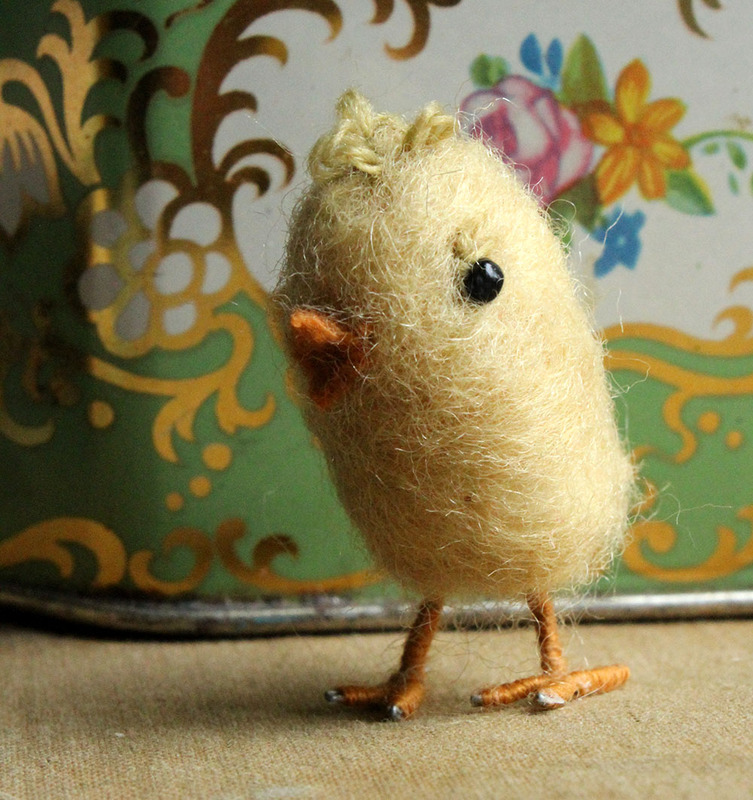 I spent the day yesterday making tiny chicks, should have them in the shop next week. 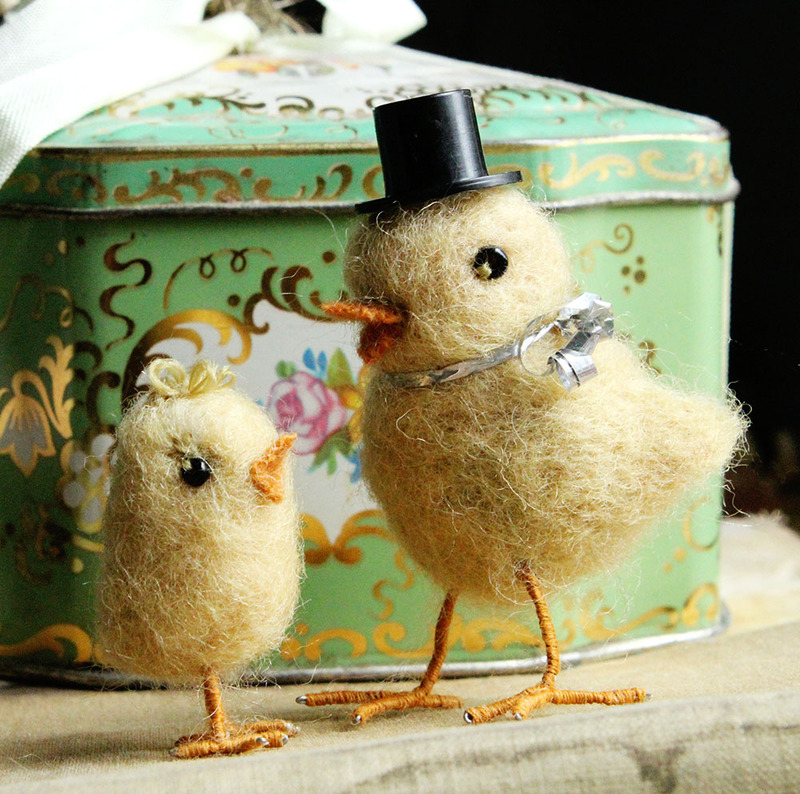 have a lovely spring weekend. 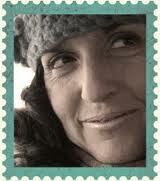 its going to be warm enough outside today to go biking and order my new greenhouse! 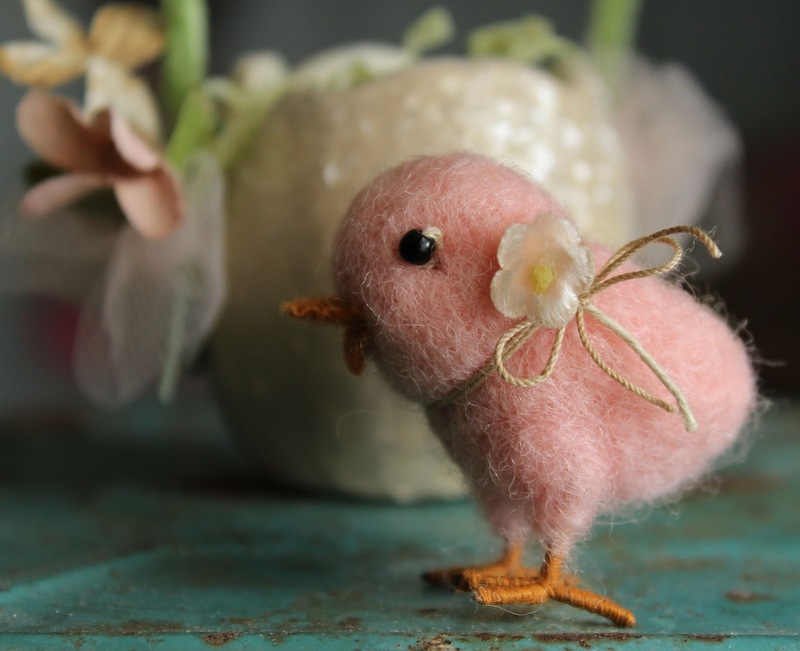 This tiny needlefelted blush pink heart is only 1.5 inches long. 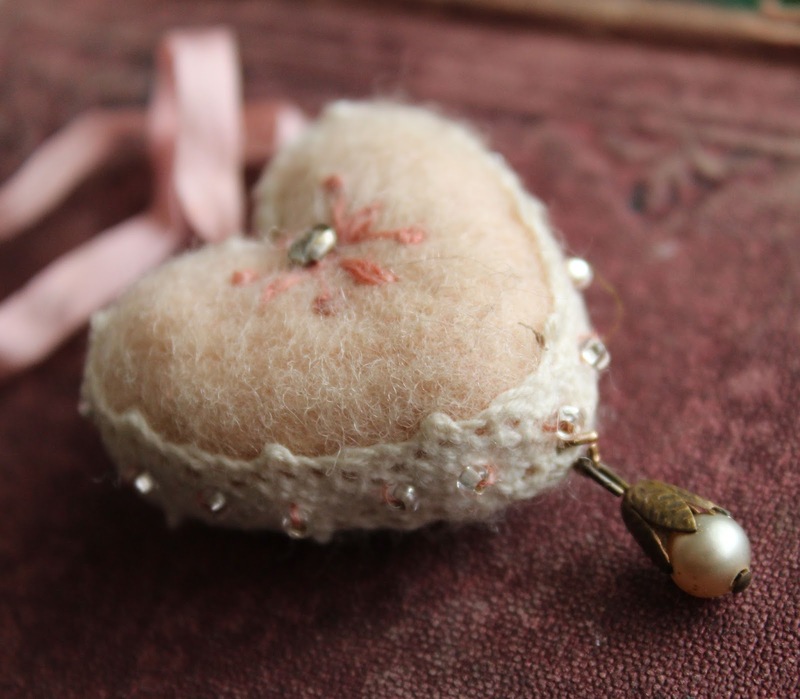 Necklace has a vintage pearl and brass tulip bezel dangle. hanging from a length of hand dyed silk ribbon. vintage starched pink cotton millinery flower and sweet pink stamens. 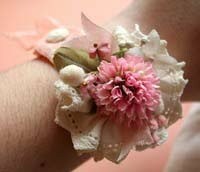 large silk chiffon vintage blossom. 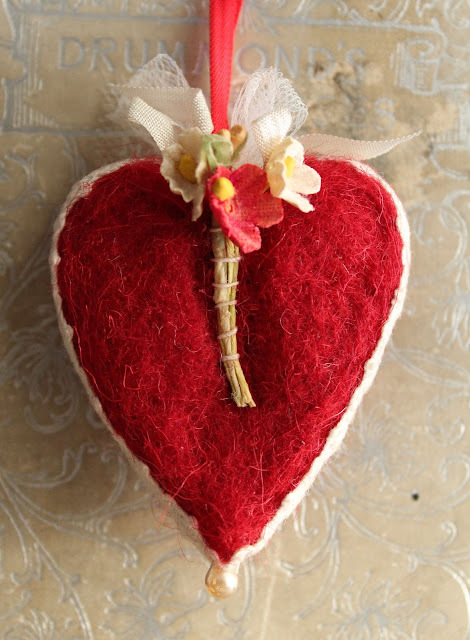 handmade valentines for your sweetheart. 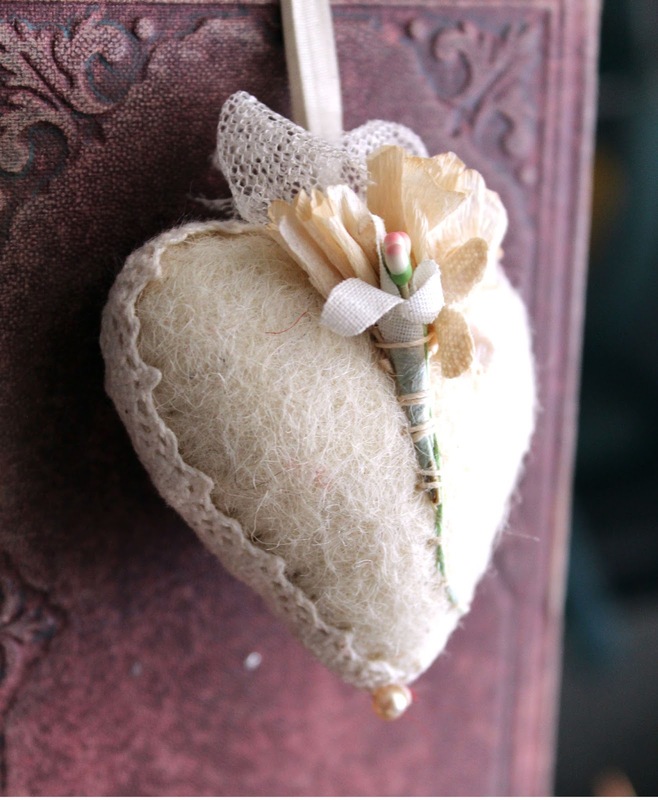 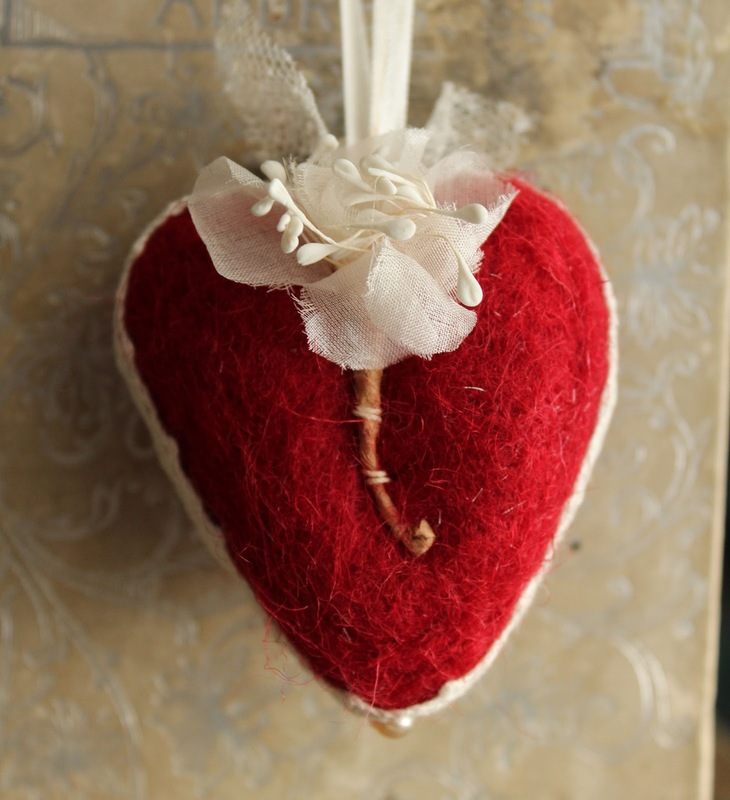 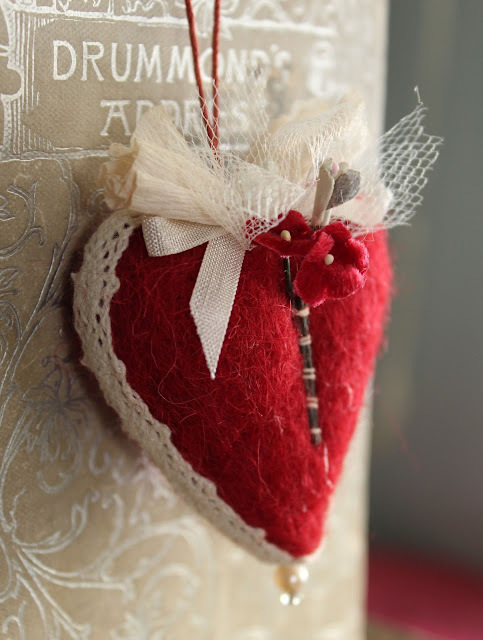 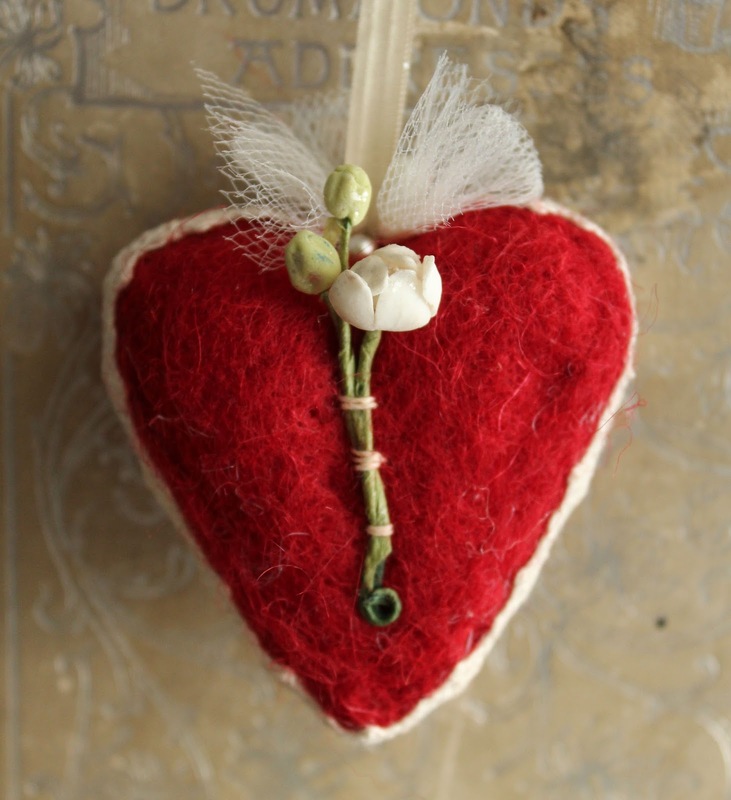 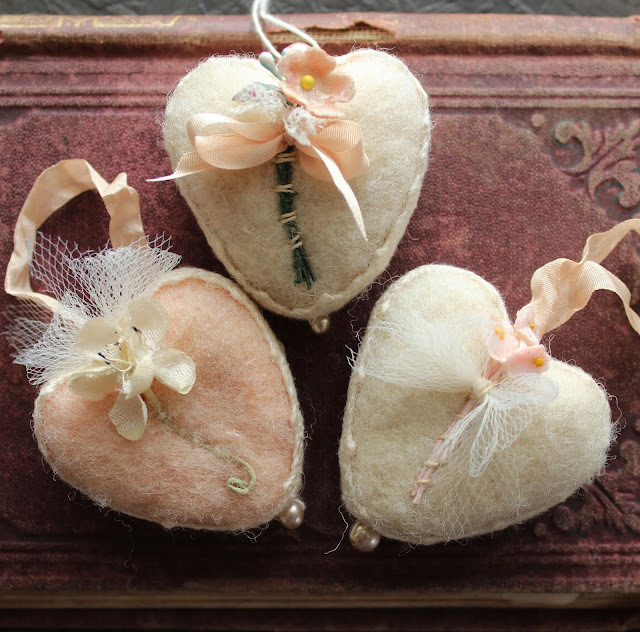 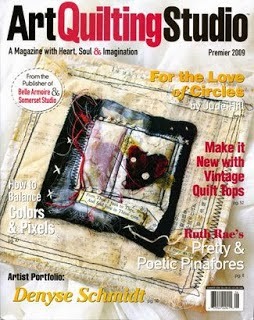 needle felted hearts in the shop today, just in time for Valentines day. 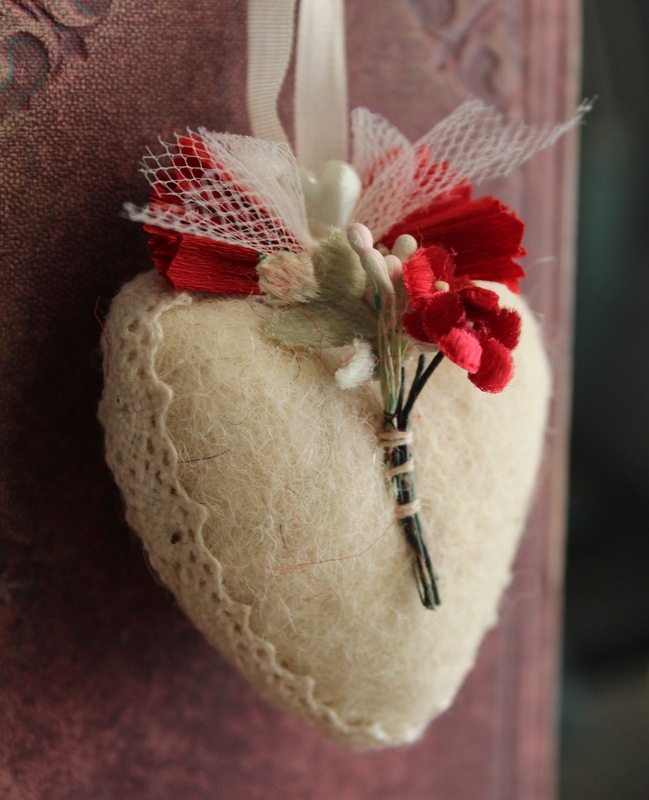 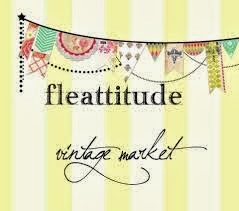 each one is an original made with vintage millinery flowers and trims. 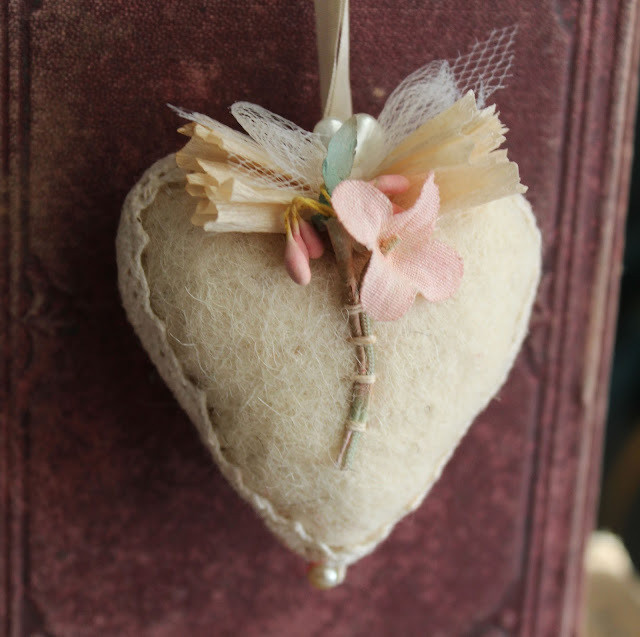 tiny pearl beads salvaged from an old necklace dangle at the bottom and sweet pearl heart pins secure tulle and silk ribbons for hanging. 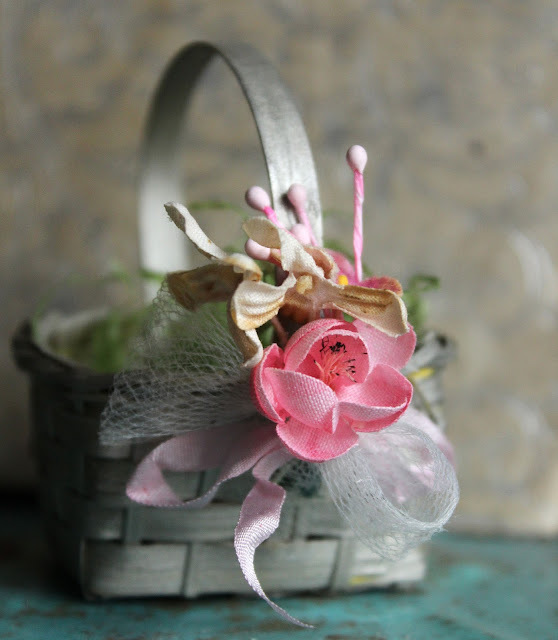 this one has a gathered vintage crepe paper ruffle spray behind the velvet flower. 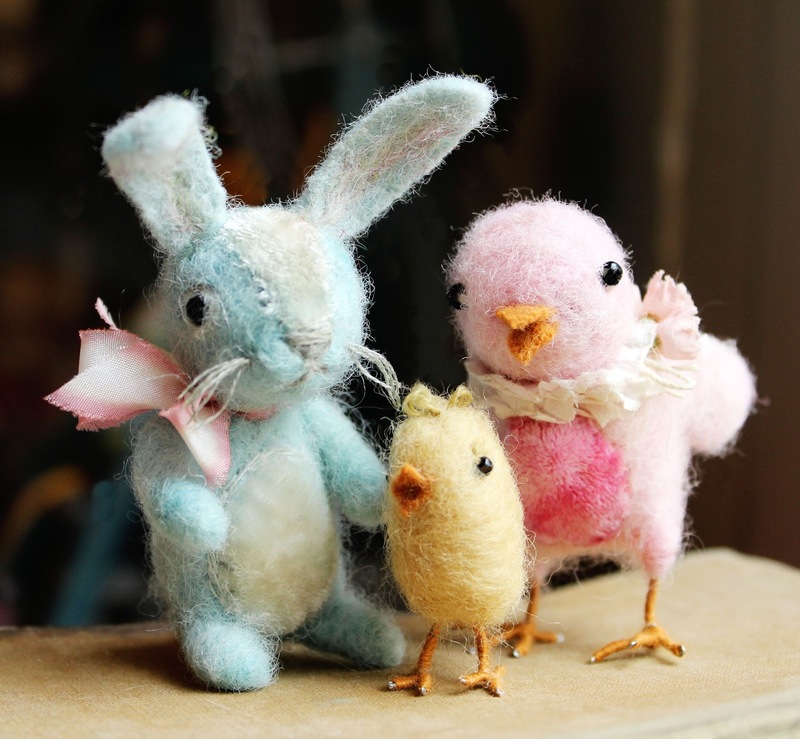 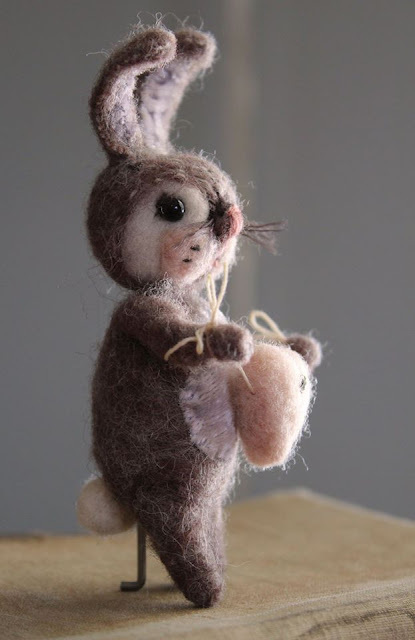 needle felted tiny Easter critters. 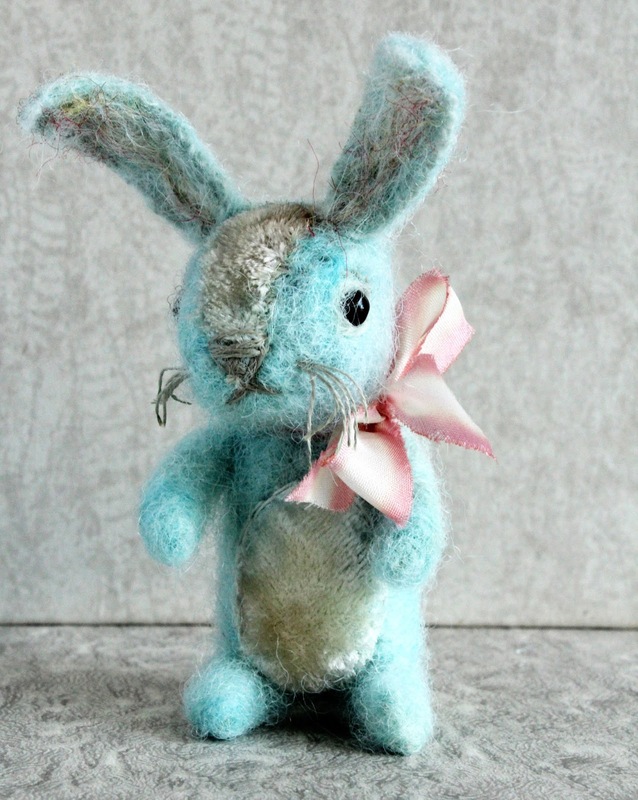 little blue bunny has hand dyed wool roving, hand dyed silk velvet and silk ribbon and his arms and legs are pose-able! stands a tiny 3 inches. thank you for visiting velveteen rabbit.